It was one year ago when Hermantown lost by just one goal to Breck in the state championship game. The Hawks were a senior led team, which was one of the reasons why it contended for a state title. This season, 14 of those seniors are gone and the big question was can Hermantown find a way to be competitive, let alone battle for state supremacy. Part of that was answered in a dominating 5-0 win against Rogers in the Section 5A final on Friday, March 4 at the Ice Forum in Champlin. The Hawks will have to wait until Wednesday, March 9 in St. Paul to answer more. For most of the season Hermantown was ranked No. 2 in Class A and had a record of 20-3-2 heading into the section playoffs. 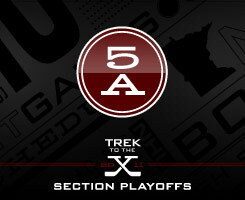 However, with only four returning players, it needed a lot of help if it were to get back to St. Paul. There are seniors on the Hermantown roster, but a majority of them were part of the junior varsity team last season. “We knew there would be questions,” Hawks senior forward Garrett Skrbich said. “Our veterans really stepped up and we knew they would." Those veterans were the ones that came through in the section championship game against the Royals. Junior Brian LeBlanc, a significant contributor to the Hawks last year, got Hermantown on the board first when he ripped a near-perfect wrist shot over the shoulder of Rogers’ goalie Robby Vukelich and in the upper right corner. He also had an assist when he played the point on a power play. He unleashes a heavy slapshot that was tipped in front by teammate Chris Benson to give the Hawks a 3-0 lead. There was Skrbich and Thomas, who also had a goal and an assist, paving the way not only for this game, but for the season. There have been times this season that the new faces to varsity hockey would have to shine. One of them was Lucas, who now holds a record of 19-3-2 in nets for Hermantown and has stood tall, despite his 5-6 frame that his coach is not affraid to point out. Rogers came out and played the first period they way it needed to in order to pull off an upset against Hermantown in the Section 5A finals. There is a second and third period, both handled heavily in favor of the Hawks. Hermantown used a five-on-three power play in the second period to stretch a 1-0 lead to a four-goal advantage in a span of 2 minutes, 20 seconds. Two goals were scored when Jake Einarson was called for cross-checking, but to make matters worse, a bench penalty was given to the Royals during the play as well. Skribich scored 1 minute, 20 seconds into the power play for a 2-0 lead and also left some time on the clock for Hermantown to set up for one last push with the man-advantage. It only took 32 seconds for the Hawks to build a three-goal lead when Benson tipped in LeBlanc’s blast from the blue line. Billy Grillo would score less than two minutes later, putting home a one-timer from the slot after Joe Hicks was able to slide it to him from behind the net. Offense was solid in that short span, but the Hawks defensive play once it got the lead was impressive. Hermantown only allowed two shots on goal in the second period and 13 over the final two periods of play. It didn’t go into a defensive shell while holding onto a big lead. Hermantown was aggressive once Rogers got to the Hawks blue line and made it difficult to gain possession past that. What little offense Rogers did have, Hermantown kept most of its shots to the outside and kept the area around Lucas fairly clean. Losing by one goal to Breck in the state championship game last season is still burning some of the Hawks. Seeing how close they were and never knowing if that chance could ever happen again is always a question. 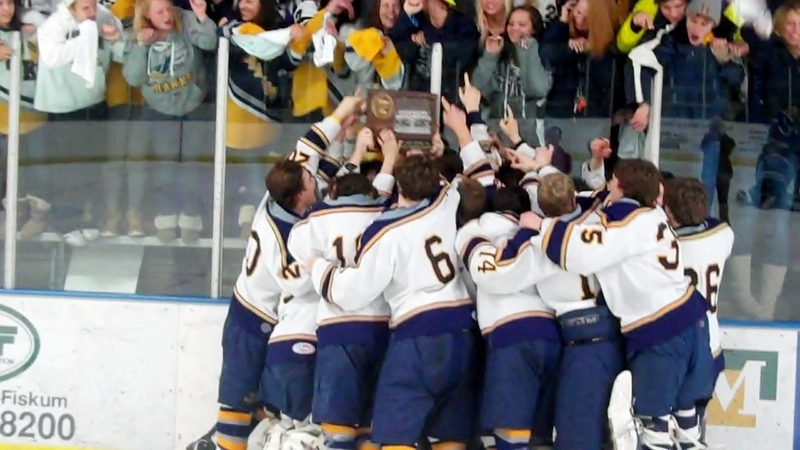 With its second consecutive trip to the state tournament and eighth in school history, Hermantown will get a chance to win its second championship after coming up just short a year ago. Depending on how the seeds are determined, a possible rematch with Breck can happen, but the Class A field will be tough with four teams ranked inside the top five in both the state and Minnesota Hockey Hub polls. Ranked teams in the Class A tournament are No. 1 St. Thomas Academy, No. 2 Hermantown, No. 3 Rochester Lourdes, No. 5 Breck and No. 8 Thief River Falls. “Hopefully we get to the same game, but with a different result,” Skrbich said. Hermantown advances to its second consecutive state tournament and eighth overall in school history with a 5-0 victory against Rogers in the Section 5A finals Friday, March 4 at the Ice Forum in Champlin. Garrett Skrbich, Jared Thomas and Brian LeBlac each had a goal and an assist for the Hawks. In the second period, Hermantown scored three goals 2 minutes, 20 seconds apart to break the game open. Two of them were a result of a five-on-three, where the Hawks scored on both penalties that they Royals took. It was a pretty quiet evening for first year starting goalie Connor Lucas. Standing only 5-6, he turned aside 21 shots and only saw two in the dominating second period by Hermantown. LeBlanc scored the first goal of the game, ripping a wrist shot off the faceoff, near the boards. It went over the shoulder and past Rogers' goalie Robby Vukelich for a 1-0 lead. In the second, up two men, Skrbich went five-hole from the bottom of the circle for a two-goal lead. Just 32 seconds later, Chris Benson extended the lead, still on the power play, when he planted himself in front of the Royals net and tipped in a shot by LeBlanc from the point. Later, Billy Grillo made it 4-0 when he one-timed a shot from the slot on a nice feed from behind the net by Joe Hicks. Thomas capped off the scoring when he tallied his 28th goal of the season and fourth of the sections when he received a pass along the left wing boards at center ice, got to the Royals blue line and drove to the net to bury a backhand in. Rogers finishes the season 18-9-1 and are still going for its first state tournament appearance. Hermantown will begin the Class A state tournament Wednesday, March 9 at the Xcel Energy Center in St. Paul. Had a goal and an assist to help his team advance to its second straight state tournament. His goal gave the Hawks an important 2-0 lead in the second period. His assist to Jared Thomas was a beautiful cross-ice breakout pass, right on the stick and in stride, which allowed his teammate to make a powerful move to the net to score in the third period. Tallied the first goal on a perfect shot off the draw in the Royals' zone. Hit the upper right corner and gave the Hawks a 1-0 lead in the second period. LeBlanc assisted on Chris Benson's goal in the second, when he blasted a slapshot from the point that was tipped in by his teammate. Lucas is in his first varsity season and he is making the most of it. He stopped 21 shots for his first postseason shutout and weathered a storm in the first when Rogers came out strong.Things were quiet in the second and third for him, but mostly because of his standout play in the first allowed the Hawks to play with a lead.